Aurangzeb should not work. The premise is silly: a long-lost twin impersonates his brother to take down their father’s criminal empire. Yet writer-director Atul Sabharwal executes his vision with such sincerity that the movie succeeds. I unapologetically love this action soap opera. Sabharwal worked in television before this, his feature film debut, and it shows. There are so many twists and turns in the plot that it feels like a full season of a TV series condensed into one 140-minute movie. Aurangzeb: The Series would fit right in alongside The Vampire Diaries on The CW. Arya (Pritviraj Sukumaran) — the film’s narrator — has a troubled relationship with his father, a disgraced police officer played by Anupam Kher in a moving cameo. Because of his father’s emotional distance, Arya was primarily raised by his uncle, Ravi (Rishi Kapoor), a crooked cop. On his deathbed, Arya’s father confesses that he has a secret wife and son that Arya is now obligated to take care of. Arya resentfully breaks the news to the woman, Veera (Tanvi Azmi), only to realize that her son looks exactly like the son of the criminal mastermind, Yashwardhan (Jackie Shroff). Uncle Ravi realizes that Veera and her son, Vishal (Arjun Kapoor), are Yashwardhan’s wife and son, presumed dead for the last 25 years after a “botched” police shootout that cost Arya’s father his job. In order to clear his father’s name, Arya and Ravi conspire to kidnap Yashwardhan’s son Ajay (also played by Arjun Kapoor) so that Vishal can impersonate his identical twin brother while acting as a police informant. Ravi explains that Vishal must act like Aurangzeb, the Mughal emperor who gained his throne by defeating the brothers ahead of him in the line of succession. The soapiness of the story is enhanced by an amazing soundtrack. Heartrending musical themes accompany Veera’s confessions to her sons. Bombastic rock blares when Ajay (or Vishal) strides into a room, ready to bust some heads. Thankfully, the soundtrack album includes several of the great instrumental songs by Amartya Rahut and Vipin Mishra. As with any good soap opera, the film is really about family conflicts: brothers turned against one another, children resentful of their parents’ favoritism, and parents who feel they can’t express their feelings to their hot-headed sons. Arya hates Vishal because of the love his own father showed the gangster’s son. Vishal hates his mother for robbing him of a relationship with his biological father. Ajay hates everybody. As in his debut, Ishaqzaade, Arjun Kapoor plays a scumbag, and he’s great at it. Ajay is loathsome almost beyond the point of sympathy, yet the hurt behind his lashing out is always obvious. Vishal undergoes some real character growth as he, too, as his timidity gives way to aggression. Pritviraj puts Arya in a similarly precarious position to Ajay’s. One of Arya’s early scenes has him belittling his dying father, so it’s hard to love him. However, it does give him room to grow when he’s forced to choose between his father’s “family first” approach to morality or his uncle’s belief in success at any cost. Rishi Kapoor is compelling as the head of a family of corrupt cops. Ravi’s son, Dev (Sikander Kher), is involved in the family business, too, and gets to do some sleazy stuff. Jackie Shroff plays the most sympathetic of the movie’s flawed father figures. Yashwardhan is old enough that he’s not the fearsome thug he once was, making it hard for Vishal to reconcile the man before him with the villainous image he was sold. The movie isn’t all emotional turmoil. There are plenty of cool fight scenes to keep things entertaining, and it’s impressive how well they integrate with the melodrama. This kind of action-soap opera can’t succeed if it’s done halfway, and Sabharwal goes all out. 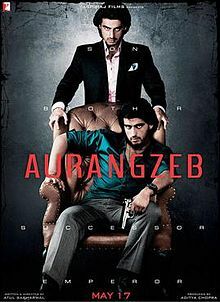 Aurangzeb is exciting, touching, and totally engrossing. This entry was posted in Reviews and tagged 2013, 3.5 Stars, Amartya Rahut, Anupam Kher, Arjun Kapoor, Atul Sabharwal, Aurangzeb, Bollywood, Hindi, Indian, Ishaqzaade, Jackie Shroff, Movie Review, Music, Pritviraj Sukumaran, Rishi Kapoor, Runtime, Sikander Kher, Tnvi Azmi, Vipin Mishra on May 17, 2013 by Kathy.